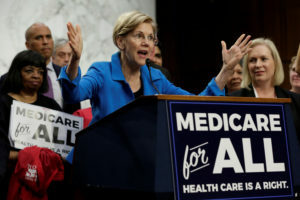 WASHINGTON — Cheered on by a handful of activists, liberal House Democrats announced outside the Capitol that they were forming a caucus to push for “Medicare for All” — shorthand for government-financed health care. Neither proposal has much chance of going anywhere in the Republican-run House or Senate. But the bigger problem for Democrats is that the two messages — fundamentally reshaping the nation’s health care system versus defending Obama’s popular law — divide the party as it tries grabbing control of Congress in this fall’s elections.